Dr. Robyn holds an advanced proficiency certificate in the Activator Methods®, which is a hand-held instrument adjusting technique that is heavily researched and gives phenomenal results to our patients. With low force and high precision, it’s safe for all age groups. 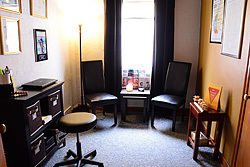 Your comfort is important to us and we’ll always fully discuss any technique used and demonstrate it for you before beginning, so you’ll feel comfortable and relaxed. At Inspire Chiropractic & Wellness Spa our techniques are comfortable for anyone. Call (712) 239-1284 to get started.